Amazon's Kindle Fire HDX 7-inch and Google's Nexus 7 are two of the most popular 7-inch tablets on the market that offer a great range of features for essentially the same price. Choosing which tablet to get can be quite difficult so I'm going to take a close look at how the two tablets compare in a number of areas to try and determine which one might be the better choice. There are several factors to consider when looking at the design of the tablets. The first is the size and the weight of them. Both weigh nearly the same with the Nexus 7 being just a fraction of a hair thinner and a very small bit lighter. Holding the two side by side you would be hard pressed to tell the difference. Instead, you will likely notice that the Nexus 7 is a bit taller when held in portrait mode while the Kindle Fire HDX 7-inch is a bit wider. This makes the Nexus 7 better suited to holding it in landscape mode for video while the Kindle Fire HDX 7-inch is more like a book for reading. In terms of the construction, the Kindle Fire HDX has a slightly better overall feel thanks to its composite and nylon construction with angled edges that fit well in your hand. In contrast, the Nexus 7 back has switched away from a rubber coated plasic to a matte plastic that doesn't have the same level of feel and grip as the original Nexus 7. If you want raw computing and graphics performance in your tablet, then the Amazon Kindle Fire HDX 7-inch has the advantage over the Google Nexus 7. Both have processor that are manufactured by Qualcomm and feature four cores. The Fire HDX processor runs at a higher clock speed and is a newer design that features faster graphics than that of a Nexus 7. Of course, you might be hard pressed to tell the difference in the current generation of applications between the two. This is probably the toughest comparison between the two tablets as they are both great screens. each offers a 1920x1080 display resolution with a very wide color gamut and bright color. Even if they are side by side, many people may be hard pressed to tell which of the two is better. If you look real hard or happen to have equipment for measuring them, the Kindle Fire HDX edges out the Nexus 7 in both color and brightness levels. Still, each tablet offers a full sRGB color gamut so they are both great for the average user. This is one of the easiest comparisons of the two. Since the Kindle Fire HDX 7-inch does not have a rear facing camera, the Google Nexus 7 is the obvious candidate for anyone that happens to want to take pictures or video with their tablet. Now the Kindle Fire HDX 7-inch isn't completely devoid of any cameras as it still does have a forward or web camera on it. It has only slightly less resolution than that of the Google Nexus 7 but in terms of functionality, they both work well enough for video chats. With the size of the tablets and the features available on each one, you would expect that the two would have very similar battery life. Testing of the tablets shows a very different experience. In digital video playback tests, the Kindle Fire HDX 7-inch was able to run for over ten hours compared to the Nexus 7 just eight hours. So if you need a long running tablet, the Kindle Fire provides roughly twenty percent more usage than the Nexus 7. Of course this applies only to video playback. Usage of the two as dedicated e-readers or as gaming platforms can have very different results. Software is where the two tablets differ the most and will likely make a person lean towards one or the other. The Nexus 7 is a plain vanilla Android installation. This means that it does not have any of the skins or extra software that all of the other tablet companies put on top of the Android operating system in order to make theirs different from the rest. In general, this makes it more responsive, faster to get updates to newer versions of Android and gives users much more flexibility in customizing their experience. 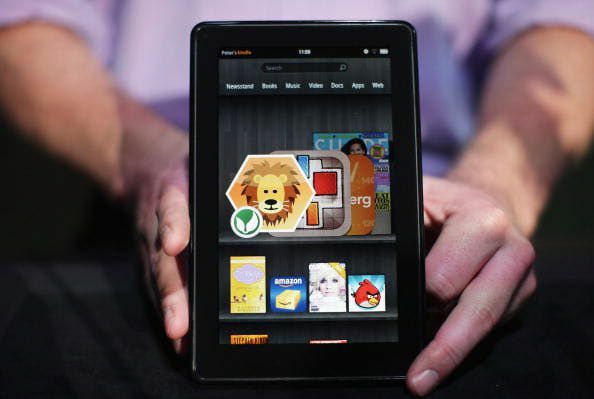 The Kindle Fire HDX 7-inch in contrast has a custom operating system designed by Amazon that is built on top of an Android core. This gives it a very different feel and makes it much more integrated into Amazon's Kindle and Instant Video services. Users don't have the ability to customize the interface as much and are locked into Amazon's app store which has less options than the Google Play store. Now this may not be a bad thing for some as it is extremely useful for those Amazon Prime members but it also includes its May Day on-demand video tech support service. This is extremely useful for anyone that is not familiar with using a tablet as an Amazon representative can assist the user at now cost on how to find and use things on the tablet. If the tablet is going to be used with children in mind, then the ability to control what those kids have access to is another concern. In this area, the Fire OS of the Amazon Kindle Fire HDX with its FreeTime mode is a much better choice. The Android OS version 4.4 also known as Kit Kat will add in improved account features for sharing a tablet but the Kindle Fire HDX still has the advantage. So which is better for tablet software? It depends on the user. Both are very functional but it comes down to how you want to use your tablet. Amazon's tablet is great for using the Amazon services and for anyone that isn't really interested in tweaking how their tablet functions. On the other hand, the Nexus 7 is an open platform that is great for someone who wants to customize their experience. You may not get the personal tech support like Amazon provides but it is still possible to use Amazon's Kindle e-reader and Instant Video through the standard Android applications. Based on all of these factors, the Amazon Kindle Fire HDX 7-inch has a slight edge. Even with that being the case, the Nexus 7 is a very suitable alternative especially if you care about having that rear camera or not being as locked into the Amazon services with the software.